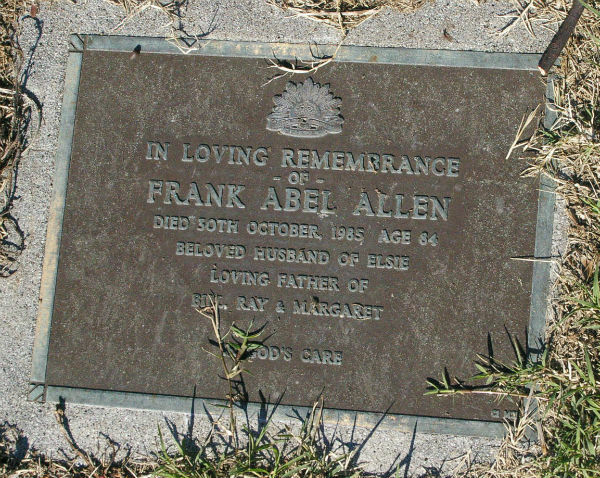 Service & personal summary Husband of Elsie Allen. At enlistment : married. Cadet with C.M.F. previous military experience. Was in reserved industry before enlistment At discharge : height 5 feet 10.5 inches, blue eyes, fair complexion, dark hair. Marital status : married. Children : 3 under 16 years old and 1 16 years & older Marks / scars : birthmark front of right leg pigmented, scar 2nd toe right foot, scar left cheek Full time war service : A.I.F. 05/06/1941 to 14/12/1945 which included 1654 days active service (54 days active service within Australia & 1450 days overseas). Operational service : Java area (embarked from Australia 02/11/1941, disembarked in Australia 21/10/1945). War badge no. 274437. Discharge certificate no. 314541. 05/06/1941 Taken on strength Recruit Reception Depot Royal Park, Victoria. 07/06/1941 Granted leave without pay 07/06/1941 to 13/06/1941 inclusive. 14/06/1941 Rejoined unit from leave without pay. 23/06/1941 Transferred to Pioneer Wing Puckapunyal, Seymour, Victoria. 08/07/1941 Posted to 4 Reinforcements 2/2 Pioneer Battalion Puckapunyal, Seymour, Victoria. 21/08/1941 Detached to Headquarters 6 Training Battalion Darley Camp, Bonegilla, Victoria. 16/10/1941 Rejoined unit from 6 Training Battalion Darley Camp, Bonegilla, Victoria. 11/01/1942 Marched out to 2/2 Pioneer Battalion Middle East. 07/03/1942 Reported missing in action in Java. 24/08/1942 Reported missing in action believed prisoner of war. 13/12/1943 Interned Thailand camp and transferred to Thai camp. 06/10/1945 Embarked Singapore on M.V. Highland Brigade. 29/11/1945 Admitted 115 Australian General Hospital, Heidelberg, Melbourne, Victoria. 30/11/1945 Evacuated from 115 Australian General Hospital, Heidelberg, Melbourne, Victoria to 50 Convalescent Hospital. 30/11/1945 Admitted from 115 Australian General Hospital, Heidelberg, Melbourne, Victoria to 50 Convalescent Hospital. 03/12/1945 Discharged from 50 Convalescent Hospital to General Details Depot, Victoria. 03/12/1945 Marched into General Details Depot ex 50 Convalescent Hospital. 05/12/1945 Marched out to Australian Military Forces Discharge Depot. 14/12/1945 Discharged Royal Park, Victoria.